a colour that supports existence. At KOMAGOME 1-14 cas, Tokyo, smbetsmb, the duo formed by Keita Shimbo and Misaco Shimbo, will present a new solo exhibition, "la maison blanche," which probes the nature of what we see in the name of "white." Working as a professional designer-and-art-director unit, smbetsmb has produced their own works based on their more spontaneous investigations into design and visual expression in general. Their two-sided activities are not totally separated, but rather integrated as complementary practices to approach the same theme and explore their techniques and thoughts on it more deeply. In each exhibition, smbetsmb explores one concept and develops their visual languages through it. Their earliest exhibition series "Ply." (2011-2014) broadly experiments on possibilities of manual printing methods, and "INTO THE WOOD" (2013) focuses on letterpress printing to visualize the richness within its finite system. 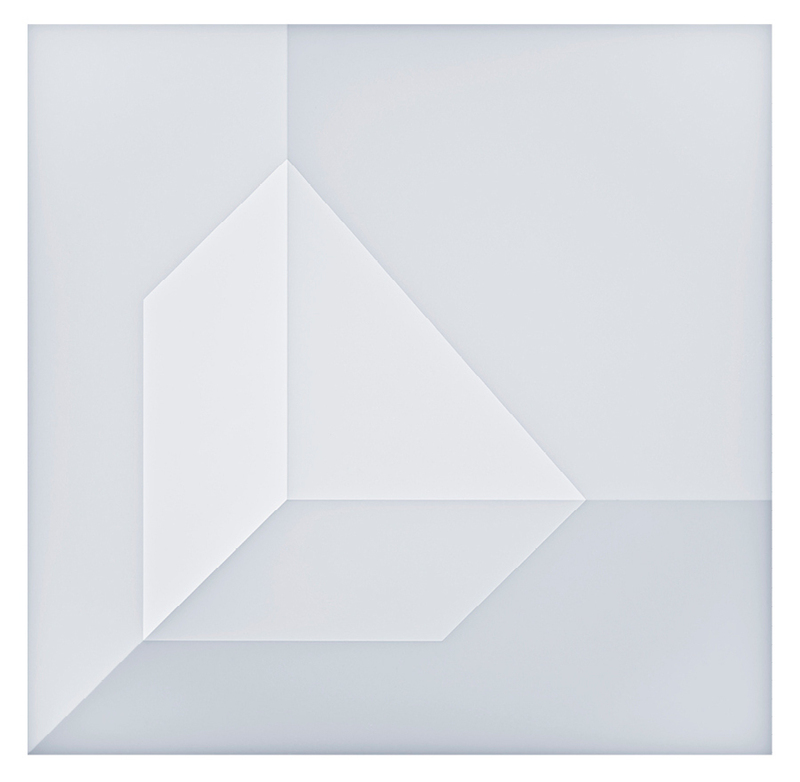 Besides, "given" (2014) demonstrates a minimalistic operation to produce a variety of shapes by folding a regular-size white translucent paper in different orders. Following this, "relations" (2015) incorporates the method of "given" with colours as another element to activate circuits of association freely running within the components of a work and between the work and surroundings. Not only do their attempts create new graphical effects, but their contemplation on the visual also guides them to question the meaning of "seeing", as well as of the visible and the invisible. This approach to the external world through the very act of seeing (and, as its other side, production of objects to be seen) can be understood as inspecting our perception from ontological and epistemological perspectives. Their recent exhibitions show this tendency more clearly, just as in "defocus" (2015), in which they abstracted fragments of the natural world into shapes of luminosity by photographing them in defocused monochrome images. The work suspends our semiotic operation to connect a shape and a corresponding category, from which a seeing subject can hardly escape, and addresses a world-view captured from between the subjective and the objective. On the other hand, the following exhibition "blink" (2016) translates a picture of a scene into numerics mapped across 257 rows and 182 columns, attempting to capture the interplay of ever-ephemeral nature, not by re-presenting it visually, but by describing fragments of meshed relations behind the pictured scene. Both exhibitions offer unique methods to see otherwise-imperceivable complicities of the world, and their works represent the very methods in the form of visible objects. Their new exhibition "la maison blanche" further explores the act of "seeing" and the interplay of the visible/invisible in it. Layered on a flat base of black, graduations of white receive light reaching the surface and create an illusory space out there, as if shedding light to a dark space little by little. The thin layers of white gradually conceal the light-absorbing black base, hiding something while revealing white as a visible object as we know. As such, the work holds moments in which the visible and the invisible, or existence and non-existence, adjoin together and shuffle their roles constantly just within an act of seeing. It maintains a certain kind of white, not as a field covered up in a given categorical colour, but as a site, or a room, that enables things to take place. We may wonder whether what we see in the name of "white" is a space with something or a void without anything. Of course, there is no fixed answer that is valid in all cases. We can only find its always-localized answer by seeing "white" as a complex site of associations and transactions, not as a self-sufficient semiotic category. Hope the white enriched by smbetsmb would become an opportunity for each of you to find this unique mode of white, be it here in the exhibition, or elsewhere after. Keita Shimbo + Misaco Shimbo. Art-director/graphic designer, working on broad areas of visual design, including VIs, CIs, book-design and art-direction. Solo exhibitions include "INTO THE WOODS"(2013), "given"(2014), "relations"(2015), "defocus"(2015), "blink"(2016).